When a confined crystal expands in volume through the accretion of atoms, ions or molecules, the term crystal growth pressure describes the mechanical force exerted by the crystal on a unit area of confining surface. 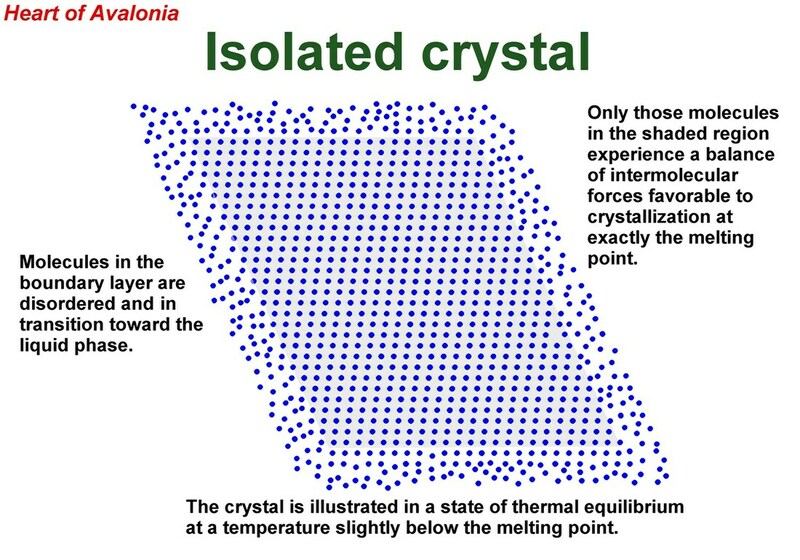 Crystal volume expansion in the presence of crystal growth pressure occurs only in a non-equilibrium thermal environment whereby work can be extracted from heat flow as permitted by the second law of thermodynamics. The above-pictured aggregate of gypsum crystals was formed several meters deep in silt in the Red River basin at Winnipeg, Manitoba, Canada. The silt was presumably permeated with water containing a concentration of dissolved calcium sulfate slightly exceeding saturation concentration and therefore favoring precipitation of crystals of calcium sulfate dihydrate (gypsum). The reaction incorporating Ca++ (aq), SO4-- (aq) and two water molecules into a crystal of gypsum is mildly exeothermic, yielding heat to the environment of 1.13 kJ/mol or 8.3 J/ g (CaSO4). 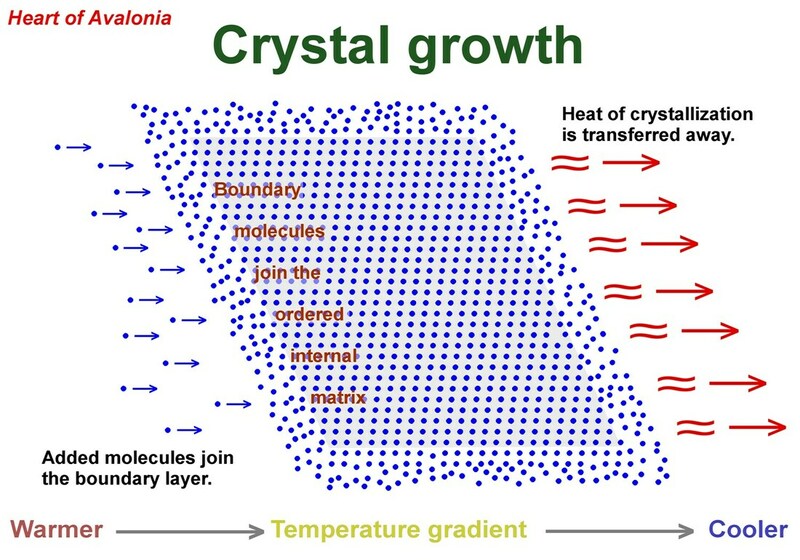 The thermal gradient needed to remove the heat of crystallization entailed heat flow across the boundary surfaces of the growing crystal mass. This heat flow, in turn, permitted a quantity of mechanical energy (work) to be extracted from the thermal environment and used in displacing silt particles obstructing volume expansion of the developing crystal cluster. The gypsum rosette shown above demonstrates the action of an inefficient but functional heat engine. The function of the heat engine was to move mud out of the way of the growing crystals. Crystal growth pressure is an eventual consequence of most igneous geological processes where crystallization occurs, even though a volume contraction typically accompanies crystallization from a melt. In a cooling and crystallizing melt, individual crystals will invariably grow against one another resulting in mechanical displacements and the fractional conversion of heat flow to work. Thus, any macroscopic mineral crystal will do work against obstructing surroundings at some point in its development. The artifacts of crystal growth pressure could be considered subtle in most aspects of igneous geology, except when considering the geometric shapes of individual crystals. The appearance of well defined, geometrically arranged crystal faces in mineral grains implies that competing material was pushed out of the way to make room for crystal growth. One area of geology where the impact of crystal growth pressure is not subtle is the consideration of the effect of crystallization of ice from water in the confining presence of rock. 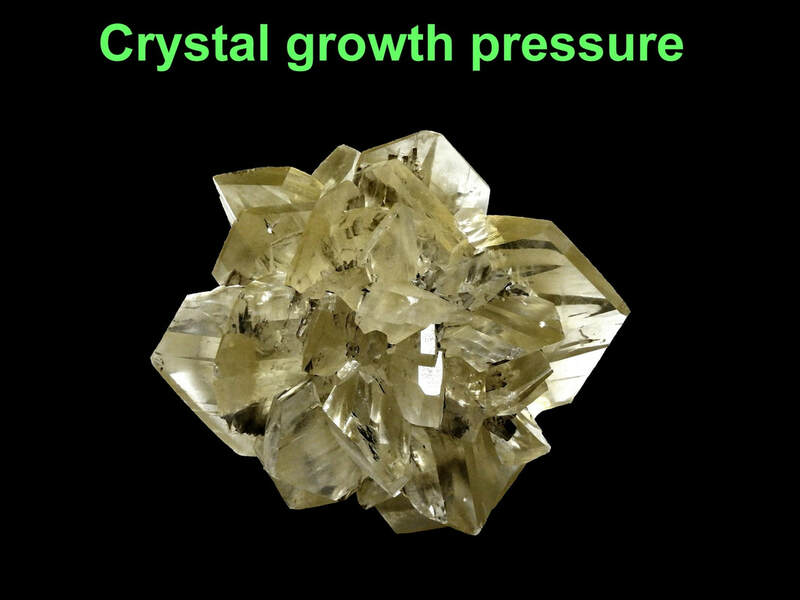 Note that crystal growth pressure only refers to pressure developed during an increase in the mass of a crystal. Ice is an unusual and potentially confusing substance in that the volume of an ice crystal at normal pressure exceeds the volume of an equivalent number of molecules of uncrystallized water. This volume expansion upon freezing readily leads to an assumption that freezing water displaces confining rock because a mass of frozen water takes up more space than an equal mass of liquid water. While this argument makes sense in frozen water pipes, it is highly questionable in geology for two reasons. First, confinement of freezing water by rocks is irregular (leaky). Second, additional unfrozen water is usually close by when water is freezing in a natural environment and this ambient unfrozen water can migrate to existing crystals of ice and augment their molecule count, generating crystal growth pressure. Crystal growth pressure provides the physical and thermodynamic basis for understanding frost heave via the process of ice segregation. The scene depicted in the above photo illustrates the disruptive impact of crystal growth pressure when ice accumulates in a partially confined non-equilibrium subglacial thermal environment. 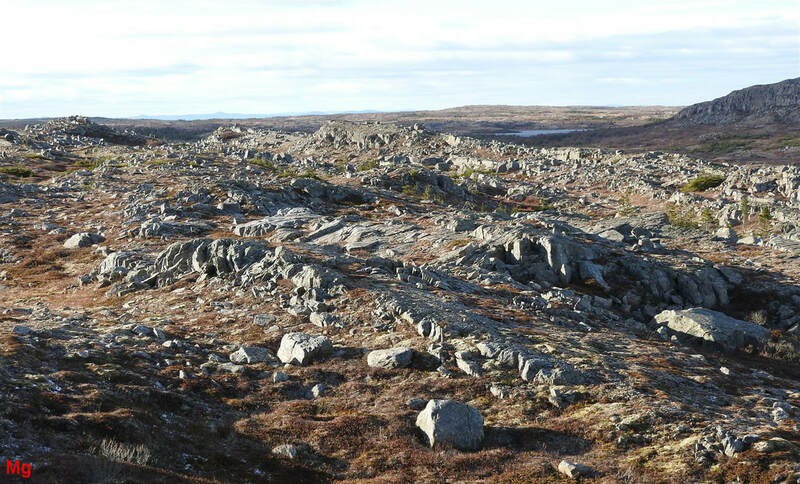 The photo shows an area of regionally metamorphosed (hence foliated) sedimentary bedrock that has been disrupted by frost heave and ice extrusion. The disruption of the rock occurred in a deep subglacial environment and was caused by the action of groundwater migrating toward the base of a cold glacier. Crystallization of water commenced at depth in the bedrock (1-2 meters) and subsequent crystal growth pressure pushed rock fragments and ice into the overlying glacier. The temperature gradient needed to power the rock displacement action was provided by intruding groundwater that crystallized as it approached the cold bedrock/glacier boundary, boosting ambient rock temperature through evolution of the heat of crystallization. The surface layer of bedrock contacting the overlying cold glacier was continuously maintained at a subfreezing temperature by conduction of heat through cold glacial ice and by advection resulting from deformational flow of cold glacial ice. 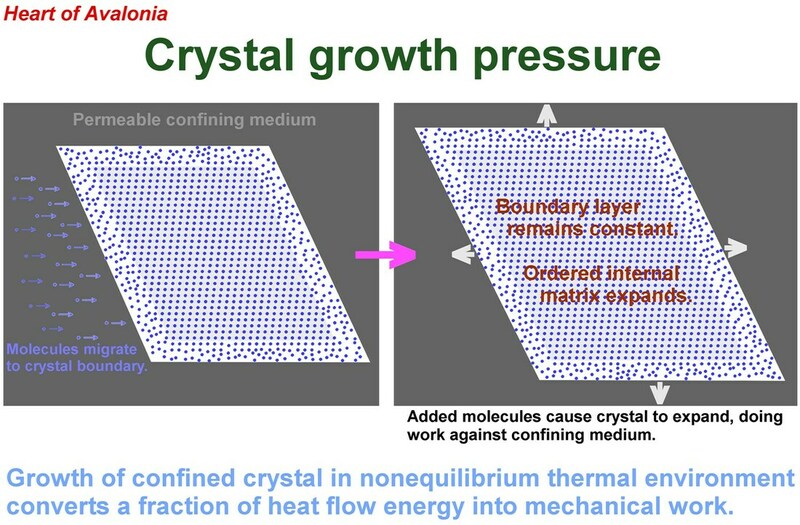 As described previously in the context of the formation of the cluster of gypsum crystals, crystal growth pressure resulting from crystallization in a partially confined non-equilibrium environment changed a portion of heat flow energy into mechanical energy. The resulting mechanical energy (work) fractured and shifted bedrock. A two-dimensional representation of an arbitrary molecular crystal is depicted in the above illustration. The crystal is very close to its melting point and is surrounded by liquid or a foreign solid. At the exact melting temperature of a crystal, the Gibbs free energy of molecules in the crystalline state matches the Gibbs free energy of molecules in the liquid state and the crystal has no spontaneous tendency to either shrink or grow. However, molecules at the crystal boundary have a higher enthalpy than do molecules in the internal lattice of the crystal since the boundary molecules are not subjected to the optimal balance of intermolecular forces that characterizes the perfectly ordered internal crystal matrix. Alternatively, it can be stated that internal molecules of the crystal lie in a deeper potential energy well than do boundary molecules. Given that the Gibbs free energy (G) of molecules in the boundary layer matches that of molecules in the internal crystal lattice, the raised enthalpy (H) of the boundary molecules must be compensated by a raised entropy (S) of these molecules (G = H - T*S). The raised entropy is reflected in the diminished confinement (order) of the boundary molecules. The above qualitative thermodynamic argument implies that for a substance like ice, where intermolecular forces are relatively strong compared to most molecular solids, and the molecules are relatively low in mass (hence intrinsically mobile if not bound), a significantly thick boundary layer will exist on crystals near the melting point. The boundary layer is important because water molecules in the boundary layer have a lower activation energy for translation (they are more easily dislodged and thus more capable of migration) than do water molecules internal to an ice crystal. Ice crystal growth can be fed by molecules migrating along a boundary layer. The above illustration shows a two-dimensional representation of a crystal existing in a temperature gradient where heat energy is transferred rightward (direction as shown in diagram), into the external environment. In this system, molecules migrating toward the crystal from the left merge with the boundary layer without thickening the boundary layer. Molecules exit the boundary layer and join the ordered internal matrix of the crystal, maintaining a dynamic equilibrium. As molecules move from the higher-energy boundary layer to the lower-energy ordered layer, heat of crystallization is conducted to the external environment, which is thereby warmed. Assuming that the temperature of the crystal does not change, the total Gibbs free energy (crystal + environment) declines as the process advances. The second law of thermodynamics allows this crystal growth process to proceed spontaneously, but furthermore, the second law permits a portion of the heat flow to be extracted as work. The work (W) done by an expanding crystal is given by W = P * deltaV, where P is the average pressure exerted by the crystal on the confining medium (crystal growth pressure) and deltaV is the change in crystal volume. The expanding crystal can be interpreted as a heat engine, extracting mechanical energy from the heat flow generated in the removal of the heat of crystallization and the consequent maintenance of the crystal at constant temperature. The second law of thermodynamics limits the efficiency (E) of a heat engine to E= deltaT / T where deltaT is the change in temperature accompanying the process and T is the absolute temperature at which the process is running. The maximum efficiency, hence maximum possible rate, of a frost heave process can be calculated, given the assumption that the process is powered by crystal growth pressure. The following example is based on the heat-flow calculations shown in Technical Note 10, where a rectangular block of bedrock with a 1 sq. m cross-section is raised 1 meter by ice accumulating beneath the block over a 200 year interval. The frost heave action is presumed to occur underneath a 200 m thick glacier possessing a 10 deg. C temperature differential (top surface to base), with a linear temperature gradient (0.05 deg. C per meter). The subglacial advective heat flow calculated from the heat of crystallization of 920 kg (1 cu. m) of ice over 200 years (6.3 x 10e9 s) is 0.05 W/sq. m. This advective heat flow is attributable to the intrusion of unfrozen water from depth (groundwater) into a bedrock frost-heave zone lying adjacent to the glacier base, whereupon the water freezes and releases the heat of crystallization. The thermal conductivity of glacial ice is sufficient to transfer 0.11 W/sq. m upward from the glacier base with the assumed 0.05 deg. C per meter temperature gradient. Given that the geothermal heat flux for rocks at earth's surface (assumed far from a plate margin) is approximately 0.06 W/sq. m, the total heat transferred from the glacier base (geothermal flux plus heat of crystallization) by conduction through 200 m of glacial ice is just sufficient to prevent excessive warming of the subglacial frost heave zone. Over a 200 year interval, 313 MJ of heat of crystallization is transferred across the frost heave zone. With the temperature differential across the frost heave zone taken to be 0.05 deg. C (thickness of the zone is 1 m) the work available from the heat flow generated by crystallizing ice is subject to a theoretical efficiency limit of deltaT/T (.05/273) = .018%. The total available work for frost heave is thus less than or equal to 57.3 kJ. Assuming no friction (an obviously invalid assumption), the mechanical energy needed to lift 1 cu. m of rock (density of rock = 2640 kg/cu. m, effective density of rock immersed in glacial ice = 1700 kg/cu. m) through a height of 1 m is 16.7 kJ. This amount of mechanical energy can readily be extracted from the heat flow calculated above without violating the second law of thermodynamics. Frictional losses include the friction associated with deforming ice in creep near the frost-heaved block, along with the friction of rock rubbing against rock as frost heave action unfolds. It is difficult to quantify the frictional losses, even approximately. However, it would be reasonable to contemplate that frictional forces might exceed the force of gravity by an order of magnitude or more. High frictional losses would lead to slower frost heave. Friction would halt frost heave entirely when crystal growth pressure reached a level such that adding water molecules to a trapped ice mass became thermodynamically unfavorable. The rough texture of the landscape shown above is primarily due to the action of subglacial bedrock frost heave. 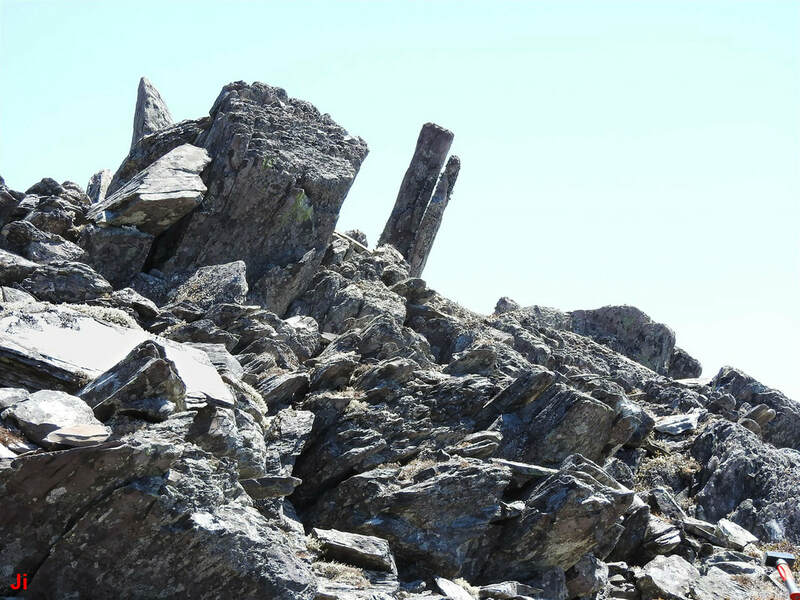 There are a few glacial erratics and some bedrock has been fractured and shifted by tangential glacial ice loading, but most bedrock disruption seen in the photo has been caused by subglacial bedrock frost heave and by extrusion of ice from bedrock. The frost heave and ice extrusion were powered by crystal growth pressure acting to expand masses of segregated ice that were partially confined within the strongly foliated and cross-jointed bedrock that characterized the area shown. This landscape provides an example of the significance of crystal growth pressure in modifying the geomorphology of special areas where permeable bedrock, artesian groundwater and cold glaciation combined to create an appropriate set of thermodynamic parameters. There are hundreds of square kilometers on the Avalon Peninsula of Newfoundland that show a similarly ice-modified geomorphology.